There's something wrong with fourteen-year-old Marjorie Barrett - her mental health seems to be declining, yet treatment from medical professionals isn't helping her one bit. Desperate to pull through the tough time where money is dwindling and Marjorie's sanity is failing, the Barretts decide to sign up for a reality TV show, where the "possession" of their daughter can be documented every minute of every day. This was Horror Aficionados' January group read! Once again, a book that wasn't even on my radar, and I never expected to like it as much as I did. What I assumed to be a story of a typical, run-of-the-mill possession, turned out to be a very thought provoking tale about the hardship (and destruction) of one family. It also touched upon several controversial subjects relating to religion and the patriarchy that dominates the Catholic faith. There certainly was a narrative here that presented itself in the form of blog posts that were periodically included amongst the chapters, and whilst the posts themselves were rather long-winded, they added a contextual dissection of events, often including an abundance of pop culture references. I found that my appreciation of these interruptions varied - one moment I enjoyed Karen's rambling, the next I felt disinterested. Back to the story itself - Merry's account of her younger self instantly pulled me in; I found how her eight-year-old mind worked to be endearing, despite at times seeming to have a great deal of maturity for her age. What she, as a child, had to go through was nothing short of appalling, but rather than some evil force being the obvious villain, it was a lot more close to home, or should I say, close to Merry. The plot heavily relied upon the interpretation of the reader, as it's essentially up to you to make your own conclusion as to whether Marjorie was indeed inhabited by some demonic entity. As for me - I leaned toward the non-supernatural explanation. There was just nothing concrete; she didn't display anything remotely inhuman. Sure, she appeared to be knowledgeable, but as stated in the book, she owned a laptop and spent most of her time on it, and we all know that literally anything can be found on the internet if you know where to look. I believe that she was a very sick girl that was exploited for money. A blunt way of putting it, but it's the ugly truth - in the face of serious financial struggle, her parents made a decision to forgo conventional medicine, and instead used their own daughter's aliment to save their nice house. What thus followed was the moronic reliance upon a priest and the accommodation of a TV crew. If you haven't already guessed, I one hundred percent believed the parents to be at fault. They were the villain. Of course, I could be completely wrong in my thinking and theory. 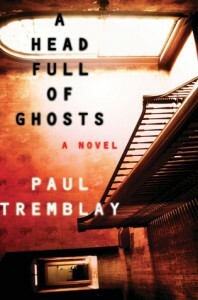 Perhaps Tremblay's intention was indeed to tell a tale of a devilish presence residing within a teenager. I'd just have to question the lack of paranormal activity if that were the case; unlike The Exorcist, there was nothing that couldn't be rationally explained. It also crossed my mind how unreliable Merry was as a protagonist. She admitted to making things up, to embellishing the truth, and it struck me that she probably had some mental issues of her own. The very last twist only proved how inaccurate her initial account turned out to be. In itself, fellow reviewers tend to either love or hate this one. In no shape or form would I describe it as poor, quite the contrary. I couldn't wait to pick it up and continue reading, despite little happening in the grand scheme of things. It's not full of blatant scares and gore, but a slow burn of the foolishness of humankind. Also, reality shows are stupid. In conclusion: A different sort of horror; one that made me think and question everything. My first experience of this author, and it won't be the last! "On the last day, their father left the house to go find food. He told Merry not to open the front door no matter what and to stay out of the basement. Hours passed and Merry didn't know what to do because Marjorie was coughing and moaning and speaking gibberish. She needed food, water, something. Merry went down into the basement to look for some secret stash of food that they'd forgotten. Instead she found tips of the growing things poking out of the basement's dirt floor. She watched them grow and grow, and as they grew, they pushed up a large shape out of the dirt, and it hung off the growing things like a broken puppet. It was the body of their mother."